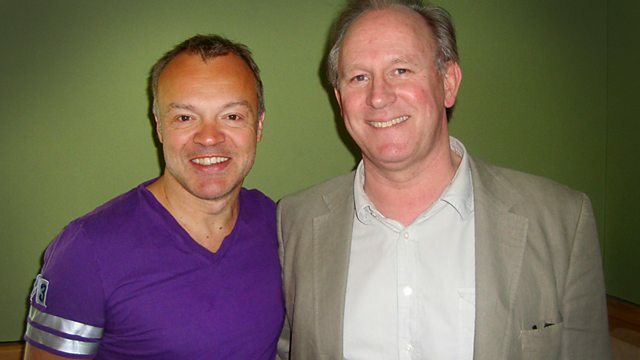 BBC Radio 2 - Graham Norton, Peter Davison and Rita Rudner direct from the West End and Vegas! Peter Davison and Rita Rudner direct from the West End and Vegas! Peter Davison, who amongst many other things was the fifth Doctor Who, popped in to see us, as did record-breaking, award-winning, Vegas-conquering comedian Rita Rudner. In another spicy Saturday morning here at Radio 2, Graham welcomed former Doctor Who - and lest we forget, the writer of the 'Button Moon' theme tune, Peter Davison into the studio. Peter chatted about his latest TV role in 'Law and Order: UK', starring in the West End and why it matters to have an 'and' before your name in the credits. Award-winning American comedian Rita Rudner joined Graham after 12 to talk about her Broadway past, why she and Celine Dion are keeping their clothes firmly ON and why it's taken her 15 years to come back to London to perform. In 'Grill Graham' this week, advice was duly dispensed to Mavis in Norwich, who wanted to know how she could see her grandchildren more, and to 'Anon' who was facing a 'it's her or me' ultimatum from his other half about a friend. Helena in Peterborough selected "a stinker" (her words) for this week's 'I Can't Believe It's Not Better', Raffaella Carra's 'Do It, Do It Again'. And in 'Tune with a Tale', Claire Schuler gave us her interpretation of Elton John's 'The Greatest Discovery'. Stevie Wonder -The Close Of A Century. Everything But The Girl - Home Movies. Rod Stewart - The Very Best Of. The Greatest Hits Of 1974 (Various). Sgt Pepper's Lonely Hearts Club Band.